Sigs (L-R) Drew Greene ‘19, Dominic Theodosatos ’21, Austin Foote ’20, Drew Brees ‘01, Tyler Skiles ’22, Eli Heddrick ‘22 and Sam Coffey ‘19. Six undergraduate Delta Delta brothers, seniors Sam Coffey and Drew Greene, junior Austin Foote, sophomore Dominic Theodosatos, and freshmen Tyler Skiles and Eli Heddrick’ traveled to Cincinnati for the New Orleans Saints vs. Bengals game at Paul Brown Stadium on November 11th. These lucky brothers attended the game and saw Brother Drew Brees ‘01, the Saints quarterback, lead his team to a 51-14 victory. 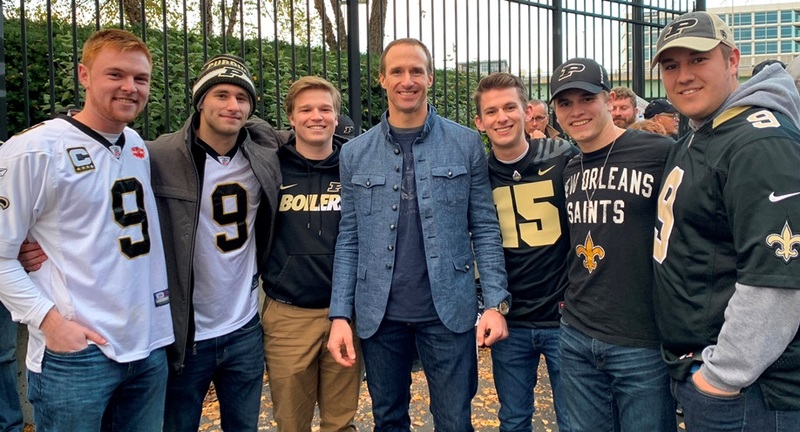 After the game the Sigs had a chance to meet Brees who is now the NFL’s all-time leader in passing yardage. Bill Steins ’86 and son, Mason on the field prior to the game. 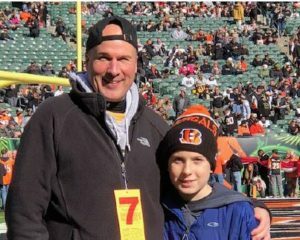 Bill Steins ’86 and his son, Mason, met the undergraduate Sigs in Cincinnati, along with Jim Vruggink, Delta Delta’s Faculty Advisor, who organized the trip as the Executive Director of the Joe Tiller Chapter of the NFF. The opportunity to attend the game was a result of a fund raiser to benefit the Scholarship Endowment for the Joe Tiller Chapter of the National Football Foundation. Sigs played a big part in contributing to this cause that raised over $29,000 for the Joe Tiller Chapter of the NFF. 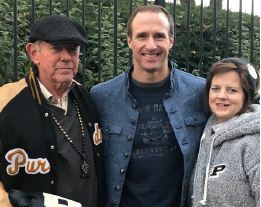 Drew Brees donated 27 tickets that were auctioned off to some very generous Delta Delta alumni including Joel Hammond ’83, Bill Steins ’86 and Jim Vruggink, CMU ‘71. The trip for the undergraduate Sigs was made possible by the generosity of Brother Hammond who donated his tickets to the undergraduate chapter. To choose which undergrads got to go to the game, the chapter sold raffle tickets to brothers who then had their names pulled out of a hat. The Delta Delta raffle raised about $1500 which was split half and half between the Huntsman Cancer Foundation and National Football Foundation. Jim MacDonald ’80, as the director of the Downtown Gridiron Club, helped the cause by allowing Jim Vruggink to “pitch” the ticket auction throughout October, leading to $8000 in additional donations from Purdue football fans. Although lofty, the Joe Tiller Chapter of the NFF is striving to build the Foundation’s assets to $500,000. The funds are used to support scholarships for high school seniors. Anyone wishing to take part can contact Jim Vruggink at jvruggink@purdue.edu.